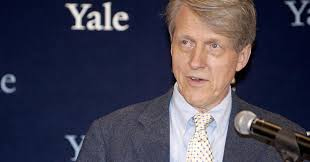 Alex Rosenberg for CNBC: Robert Shiller is well-known for his views on valuation, volatility, dividends and bubbles. But when asked what currently worries him most, the Yale professor of economics turned to another subject entirely. "A theme that I have been coming back to is that the big worry that's on people's minds — I don't know how active it is in trading — but it's about where the world is going with automation and robotics," Shiller said in a Wednesday interview on CNBC's "Trading Nation." Providing just one recent example of technological advancements pushing aside traditional human roles, the Nobel laureate cited the attempt by two Norwegian companies to develop a crewless container ship. "We are going to see ships sailing across the ocean with nobody on it, just cargo — like driverless cars," Shiller said. "These things keep coming up and I think they make people worry about everything, including even stocks. You don't know how all this automation is going to play out for various kinds of companies. This is what, I imagine, is on people's minds all the time now." In a Thursday interview on CNBC's "Halftime Report," Shiller added that these concerns may actually be spurring the stock market rally. "It just seems like, it doesn't matter what job you have, there's always some robot out there about to take it," he said. "I think people are worried, and they want to buy tech, because they feel like they're taking part [in] the thing that's threatening them. So there is this deep emotional fear which is increasing, which is having the effect of pushing up prices for now."